The very first scene in “The Squid and the Whale” is a family tennis match, father Bernard (Jeff Daniels), mother Joan (Laura Linney), high-school-age son Walt (Jesse Eisenberg) and a younger son on the cusp of puberty Frank (Owen Kline). And there’s something “off” — Dad is telling his partner to hit the ball as hard as he can, right at Mom. Now this is, in fact, the central unchivalric strategy in mixed doubles — the women’s game is slower and softer. But hypercompetitive Dad doesn’t understand the difference between a family occasion and Centre Court at Wimbledon, and acts all puzzled when mom walks off the court in disgust. He sleeps on the couch that night. But though the subtext here is as poisonous as an Ingmar Bergman marital quarrel, the sequence is typical of how “The Squid and the Whale” operates — it’s not a harrowing Bergman-like movie at all, instead coming in the form of a muted comedy of manners set in the world of Manhattan’s Smart Set, where the typical marriage involves two parents with literary ambitions, million-dollar brownstones, private academies. And divorce. A gentile Woody Allen World, in other words. It comes as no surprise when, very early on, the parents call their sons down for The Talk (this is the scene we see on the film’s poster). They will be getting a divorce. Dad will be moving out. They’ve agreed to joint custody. But, they assure the children, they still love them and nothing will be different for them. And if you believe that … These kids know how to spell. And what words mean. The rest of the movie deals with the fallout from this explosion (the film’s tagline at the Internet Movie Database is “Joint Custody Blows”). It’s familiar to all sociologists who study the divorce culture, but which a great work of art can make you see and feel, both in the particular details of the Manhattan Smart Set physical plant and its more universal psychological territory. (I saw “The Squid and the Whale” with a red-state critic friend about my age whose parents divorced in the 80s, and he said it was like watching his teenage life.) It’s all there — new couplings for the parents, the headaches of switching homes every other day, weird and perverse forms of acting out by the boys, contentiousness over custody time and what the children do around the other parent, and (this was the most impressive part) the way the sons drift toward one parent or the other and wind up de facto “divorcing” each other, as if the sins of the parents are passed on. 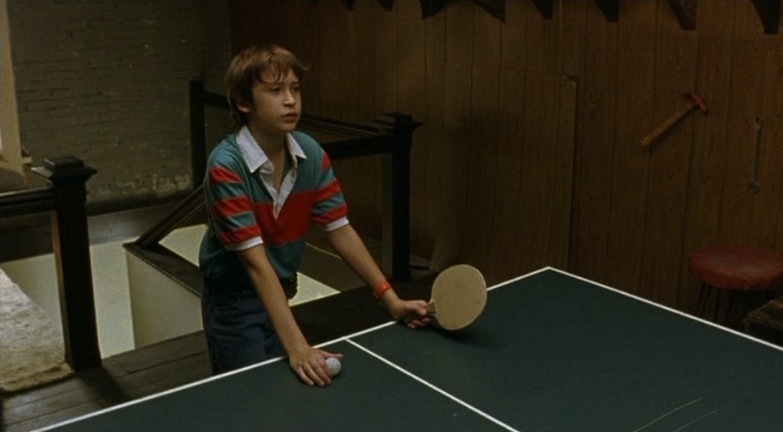 In one telling scene, Dad plays ping-pong with Frank, who has more-or-less sided with Mom. And Dad repeats the same attitude he had in the opening tennis match, as if it’s all that’s happened is water off rocks to him. I’d never seen anything previous by writer-director Noah Baumbach, but this film had the feel of one of Whit Stillman’s upper-class New York comedies — scaldingly truthful, precisely observed, more wryly amusing than gut-busting, and with characters so self-absorbed they don’t know they’re funny. The script is filled with gems of dialog and just-so details that create this Manhattan divorce culture of clueless pretension. The characters’ behavior throughout is hyper — hyperaggressive, hyperarticulate, hypertalkative, hypersensitive, even hyper-passive-aggressive (if that makes any sense). All evidence from what we see of his housekeeping to the contrary, Dad insists that he did in fact do his fair share of kitchen work — “I made burgers that time you had pneumonia.” On the wall of the elder son’s new room (and nothing is made of it in the shots it’s seen) is a movie poster for the 70s French classic “The Mother and the Whore” — I nearly laughed myself silly (practically alone among the huge Toronto Film Festival audience), not just at the obvious title and the less-obvious milieu similarities between the movies, but at the “just-so-ness” of a teen in this world having a 3 1/2-hour French art film poster on his otherwise-empty wall, like a boy in Minnesota might cram his with hockey posters. Baumbach also shows the way people have to pretend to knowledge they don’t have and can never profess ignorance — I’ll forever treasure a discussion of “Metamorphosis” in which a potential girlfriend asks Walt about Kafka’s use of something-or-other and Walt vaguely says, “it was very Kafkaesque.” And it comes out rather bluntly that one factor in the divorce was jealousy surrounding the parents’ literary fortunes — dad’s falling, and mom’s rising after years in his shadow. The film is very specifically set in the 1980s and every detail feels right to this person born in 1966, only without overloading the film with arch cuteness like Baumbach’s producer and collaborator Wes Anderson does. The grainy film stock and slightly recessive color gives “The Squid and the Whale” the look of a 20-year-old film print, like we’re voyeuristically looking at someone’s 1980s-made home movies (which we may be; Daniels’ character is reportedly based on Baumbach’s father and Walt is obviously an authorial surrogate). A seduction is scored to Bryan Adams’ “Run to You” (perfect) and one poignant scene is scored to Schoolhouse Rock’s “Figure 8” (almost brought tears to my eyes, especially when it went on for far longer than I expected). There is not a weak performance in the film. Who could have believed that Jeff Daniels, who made a successful comedy a la Farrelly Brothers (“Dumb and Dumber”), could be just as good in this sort of comedy — creating a man for whom being right is everything and the only thing, a man so clueless and self-absorbed as to argue “sampling”-like points of intellectual property law with the principal when his son is caught red-handed in an act of musical plagiarism. 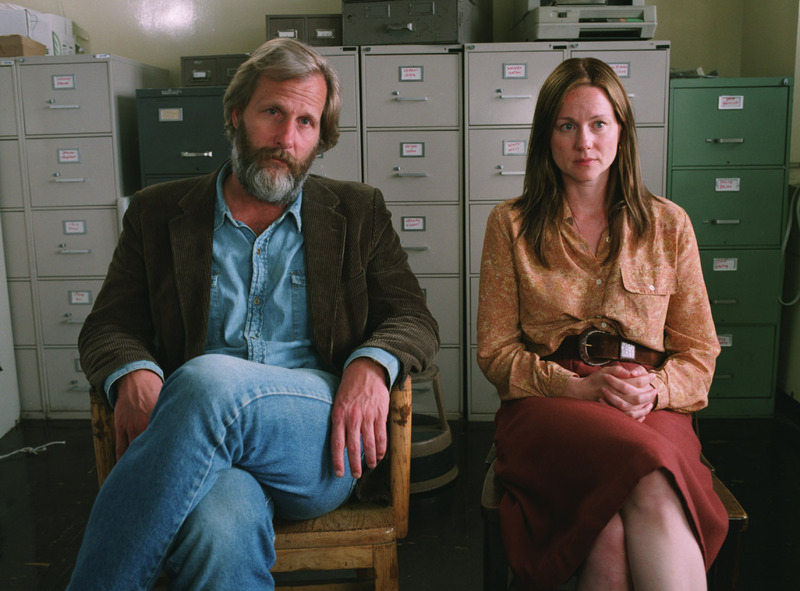 Laura Linney is a kind of postmodern Earth Mother — the casting says it all. She just exudes the role, never seeming to “act” around the hyperarticulate males surrounding her. Jesse Eisenberg (experienced in playing this milieu from “Roger Dodger” a couple of years ago) plays the elder brother, and you can almost see him, both Eisenberg and the character, grow up into one of the characters Baumbach regular Chris Eigeman plays in Stillman’s movies. And why he gravitates to his father (while hating him) and blames the mother. And miracle of miracles, we actually get a strong performance from one of The Lesser Baldwins (William) as Ivan, the club tennis pro. Playing a dumb, goofy studboy was obviously within his range.